As an employer with over 250 staff, Suffolk Libraries is required by law to carry out Gender Pay reporting under the Equality Act 2010 (Gender Pay Gap Information) regulations 2017. On 5 April 2018 we employed 274 permanent staff: 230 females and 44 males. 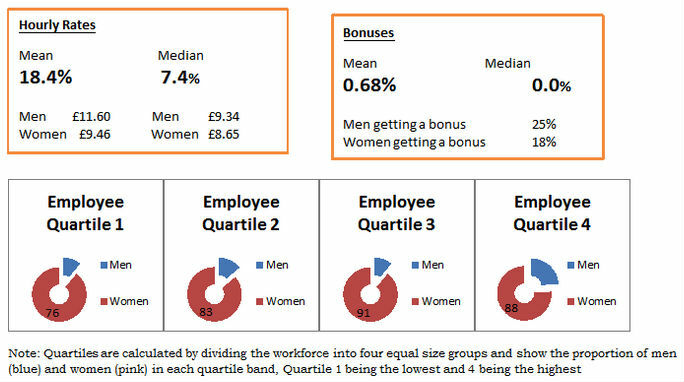 The gender pay gap between men and women was 18.4% compared with 11.2% in 2017. Based on the top 20 male and female pay rates, the mean gender pay gap is only 1.94%, which shows there is more equality in higher paid roles. Our Senior Leadership Team is fully committed to focusing on development opportunities across the organisation and especially on enabling all colleagues to fulfil their potential. For example, in October 2018, we created new Executive Library Manager roles, which have created a more obvious career progression for developing leaders. We are also creating a flexible reward and benefit scheme designed to attract a diverse range of future employees while retaining existing staff.